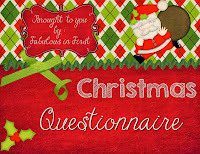 Pinkadots Elementary : Christmas Questionnaire! I love linky parties especially when they are about getting to know fellow blogging buddies better! 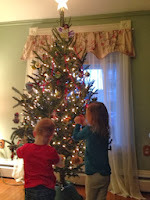 :) I am linking up with my new friend, Michelle, over at Fabulous in First. Hot chocolate. Just the name eggnog makes me want to gag! I made the BEST hot chocolate the other night for my husband and four year old daughter with a DD K-cup, whole milk, whip cream, chocolate chips, and rainbow sprinkles on top! In our house Santa wraps all the presents. The only thing unwrapped are the stockings and they are full of small toys, gloves, a hat, nuts, fruit, and candy. My kid are both allergic to peanuts so we probably won't go with the nut tradition. I know it's boring but I love white, it looks so pretty from the outside! 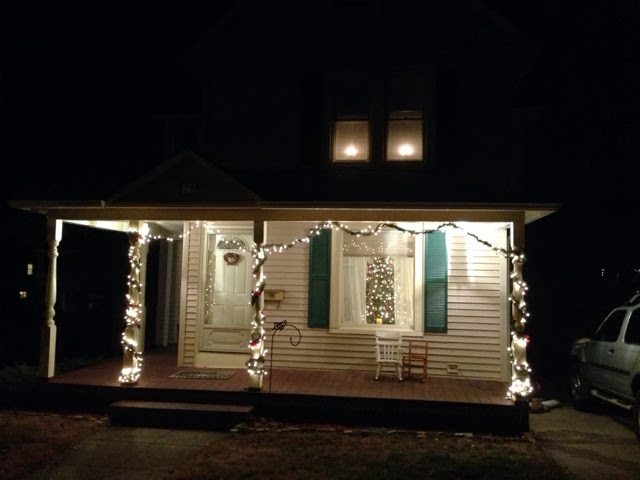 Maybe one of these years I will get colored lights!? This was our first year hosting Thanksgiving, so I needed a little recuperation time before decorating. We just did it this past weekend (12/7) and it really put us into the Christmas spirit. I grew up with fake trees, but my husband is dead set on real. I'd love to go to a Christmas Tree Farm and start a new tradition, but we haven't yet. Usually we just go to a man on the side of the road selling Christmas trees. Right now a start, but usually it is an angel. We always had a huge Christmas Eve celebration with family at my Grandmother's house. Now it is at my parent's house. Like I mentioned before I'd like to add the tradition of getting our Christmas tree at a Christmas Tree Farm and also go to see Bright Lights, which is a whole street of people's houses decorated with lights. Giving! Not only do I love giving, but I usually over buy for my family. I absolutely love Christmas music and in high school participated in a Christmas concert around the town daily with Show Choir or Madrigals. My favorite song is either Oh Holy Night, Ave Maria, or In the Bleak Mid Winter. I hate shopping in stores with crowds. I am a HUGE Amazon Prime fan. Hope you learned something new about me and will consider linking up! SIX more days until break! I don't even like saying the word eggnog. I love white lights too. Always have. I don't think I'll ever change my mind...unless they get strings of all pink...which I've never seen, but I don't doubt they are out there. Finally have time to blog hop, we have a "cold" day in Wisconsin today and tomorrow. Glad I am not the only one that needed to recuperate before putting up Christmas items. Happy New Year!